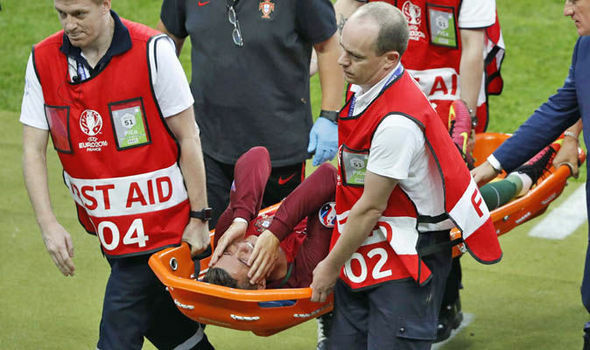 Real Madrid and Portugal attacker, Cristiano Ronaldo, could be ruled out for up to four or five months due to the injury he suffered in the final of Euro 2016, according to reports. The 31-year-old was on the end of a heavy challenge from France midfielder, Dimitri Payet, early on in Sunday’s final, and despite trying to play on he was eventually forced to leave the game on a stretcher in the 25th minute. Ronaldo was in tears as he was carried off, but returned to the touchline with his knee bandaged later in the match to cheer his side on to their surprise 1-0 triumph over the tournament hosts. However, Managing Madrid reports that the first tests by Portuguese doctors have suggested a partly-torn ACL, which could see the three-time Ballon d’Or winner ruled out until the latter stages of the year. Should that be the case, Ronaldo would miss the start of his side’s Champions League defence and La Liga season, in addition to the European Super Cup meeting with Sevilla.